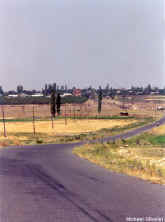 North from Shamiram is the small hamlet of Dprevank, just left from the main Highway. paved road leads to the village, with the impressive domed Cathedral church of Snt. Gregory, built in 666. Beside it are the excavated remains of the Mamikonian palace, as well as basilica from 4-5th centuries and other early constructions. Nearby are ruined walls from a 4-16th c. fortress, among the well-built 19th c. stone houses. All around the village are Bronze Age tombs, some with menhirs (huge stone pillars usually standing in the middle of such burials), hellenistic period sarkofags, medieval graveyards, Early Christian stelas, as well as traces of medieval wineries and settlements, constructions, khachkars, circular tower, caves and many other antiquities. There is a 19th century church in the middle of the village, with early khachkars built into it's walls.